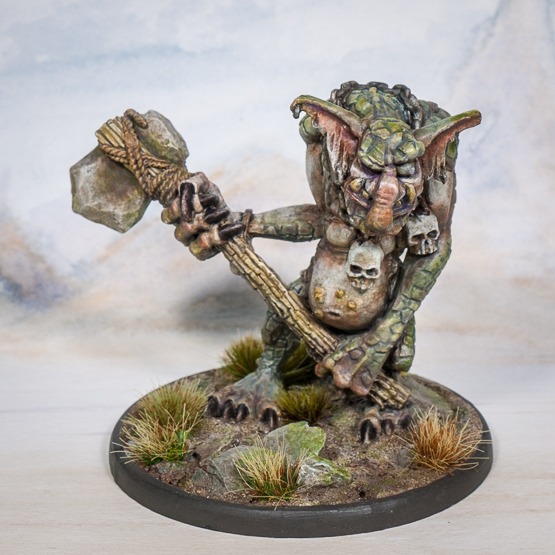 A Stone Troll, from the days of yore. I have recently started to collect greenskins from 1992, the year I started playing Warhammer Fantasy Battle. I got a bit nostalgic over the Christmas period when I re-discovered all my old White Dwarf magazines in the loft with the xmas decorations. Then I discovered the Middlehammer group on facebook, and it escalated quite quickly from there! Now I have about a dozen each of the orcs and goblins, plus a few other models. I couldn't resist picking this model up too and started to paint it up just as soon as the old paintwork had been stripped away. I was torn between painting it in the old school style or giving it my own interpretation. It started as grey skinned and evolved from there. It was a real blast to paint, pretty easy too being so large. It was mostly glazing and shading up from white as I usually do, with lots of areas roughly stippled for speedy progress. The bulging eye I never really liked, so I painted it as blind to divert attention to other areas. There are more pictures on my facebook page, more angles to view. 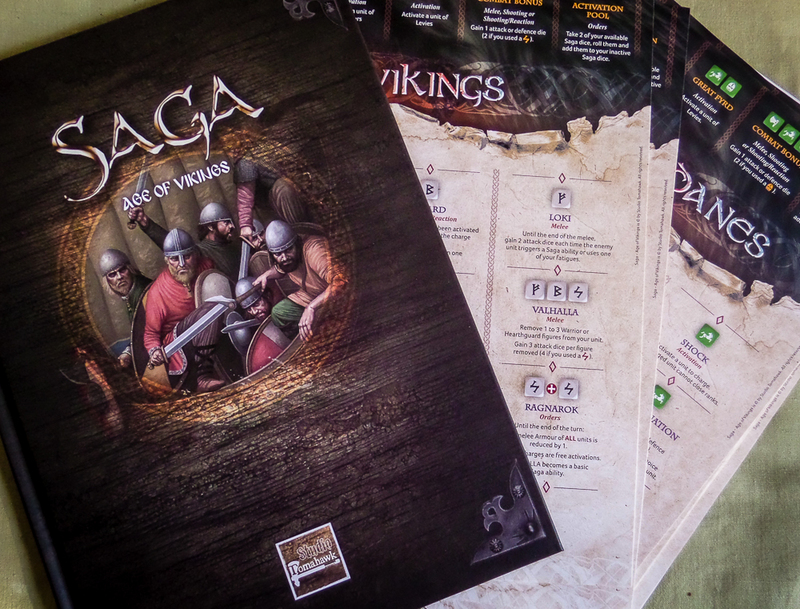 It's time to try out the new version of Saga, with my Vikings taking on Matt's Anglo-Saxons. These are two of the simplest factions to use, perfect for a first game with a new ruleset. We skipped terrain setup and just launched straight in, not being particularly competitive types. The game looks and feels and plays very like the previous version. Changes have been made to streamline gameplay, there's less fiddly measurement involved and far more action. I would describe the changes made as subtle, none game changing on their own, but they all add up to a slightly different game. 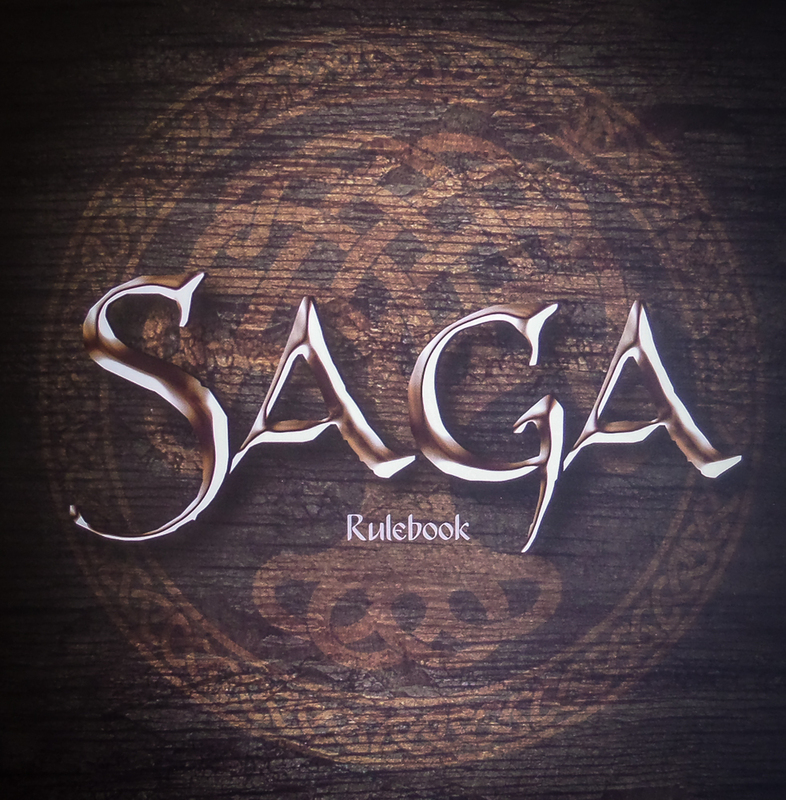 The first change of note is generating Saga dice. All units now generate one Saga dice, though warriors and levy cease to do so once they fall below a certain size. No more single warriors hiding in woods generating dice! You can also leave Saga dice on your battle board and not affect the number of dice thrown, useful for building up a cunning plan. Movement has been tidied up, again not in a major way for casual players. Units can activate for free if they are more than L from enemy units, which allows stranded units to get back into the thick of the action without spending Saga dice. There's greater explanation on how to charge units. Melee has been tweaked a little, again not by much. There is a clear step by step guide on how to execute combat, generating combat dice, using abilities and fatigue, withdrawals and such like. 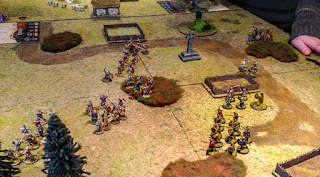 Defenders get the chance to close ranks, losing half their attack dice to benefit from a better chance to cancel hits. Again, it's not a major change and you will find melee tends to play out as before. This lone viking would have struggled in the previous version as he did in the new game! Probably the most significant change is the way Warlords operate. They still gain a free activation, and can gift a nearby unit with one. They now generate eight dice in combat, but must fight alone, there's no more With Me rule. When he takes wounds he can spend fatigue to ignore it, or pass it on to nearby hearthguard. If you keep your Warlord and his bodyguard close by you will not notice a huge difference to how it pans out. The fatigue system has probably changed the most. All units now take three fatigue before they are exhausted. You can spend enemy fatigue in the same way as the previous version, but there's also the opportunity to spend two fatigue to cancel an activation. I think that's the bulk of the most noticeable rule changes. We got along fine given our previous experience. 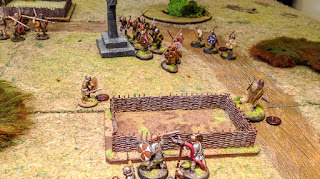 The game was more action packed as it's easier to keep units in the thick of things. I found it a little smoother, no more fiddling with VS measurements in combat which was always a bit laborious. It's too soon to say how the factions have fared after just one game, but those Anglo Saxons sure seem to have picked up a few melee moves, my vikings were slaughtered. They are keen to exact revenge, maybe for the next game I will switch things around a little, teach those Saxon dogs a lesson! 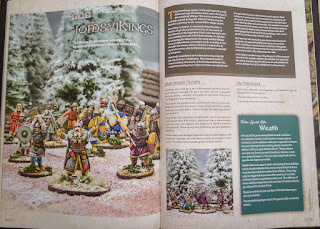 As it's Thorsday, it's a good day to have a first look at the new Saga source book, Age of Vikings. As with the new rulebook, I picked this up over the weekend at the Vapnartak wargames show in York. I have had a brief flick through, looking particularly at my own two factions, the Danes and Vikings. These are just my first impressions, an overview of what you get for your hard-earned danegeld. The book is hardcover, A4 size, 72 full colour pages. In addition you get twelve faction battle boards, printed on stock card, which is possibly a little thinner than the original dark ages boards. These follow the standard design of basic activations along the top, with more advanced activations below. They are clear and easy to read. 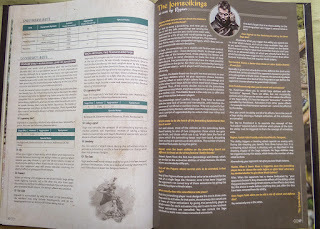 After an introduction, each faction gets four or so pages of commentary. This is usually one full page colour photo of some minis, then factions rules and force selection, followed by a question and answer page on the abilities. 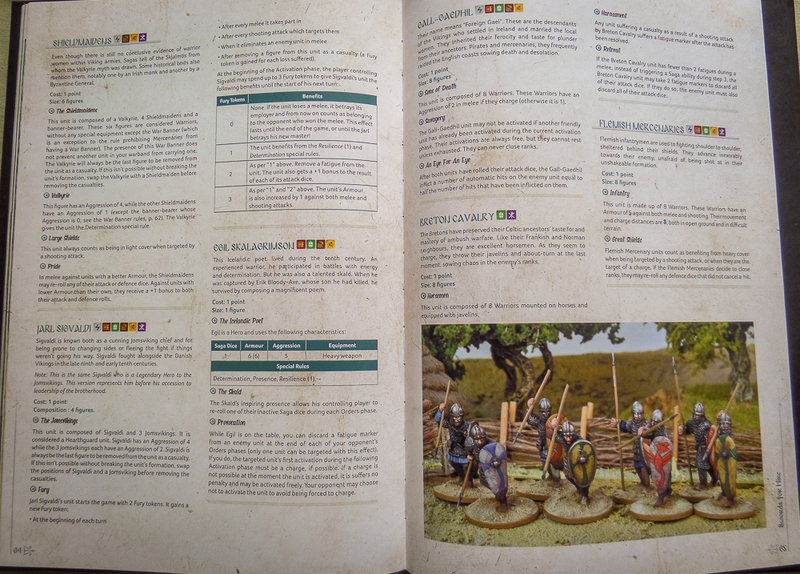 Coverage of the twelve factions takes up the bulk of the contents. 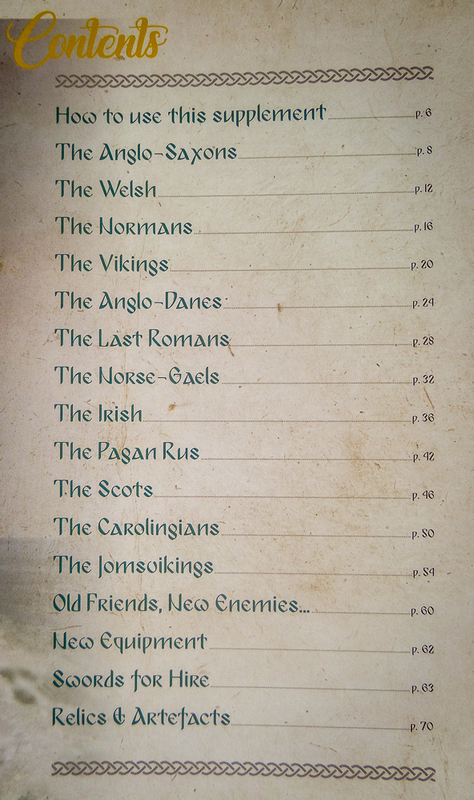 There is then a section on Friends and Enemies, in which more obscure factions are highlighted and how they should be used - for example, Germanic peoples can be included by using the Aetius and Arthur Saxons battle board. 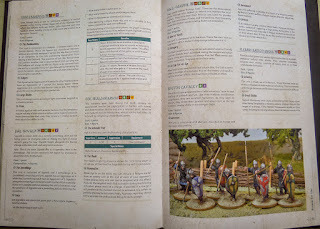 A one page explanation of War Banners follows in the section on New Equipment. 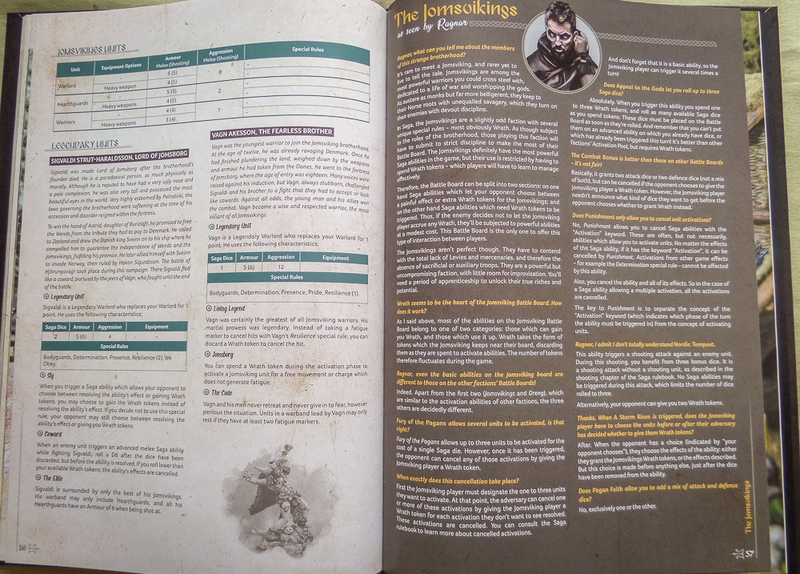 Swords for Hire is, as you might expect, a section detailing the mercenaries available to each faction. Here you will find units such as shieldmaidens, Breton cavalry and Flemish mercenaries. There is also a list of various personalities and troops you might hire - scouts, a priest or a personal champion perhaps. Finally, there is an optional section on relics and artefacts, detailing items such as the sacred banner, the ancestral sword or the famous steed. At first glance, the battle boards have not changed drastically. I have mainly looked at the two boards I am familiar with, Danes and Vikings. On the whole, the abilities are named as in the previous version of Saga and work in the same or a similar way. It will take a few games with the new rules to see just how much (or little) this aspect of the game has changed in conjunction with the updated rules. I have a game coming up over the weekend so will be able to make a better appraisal then. 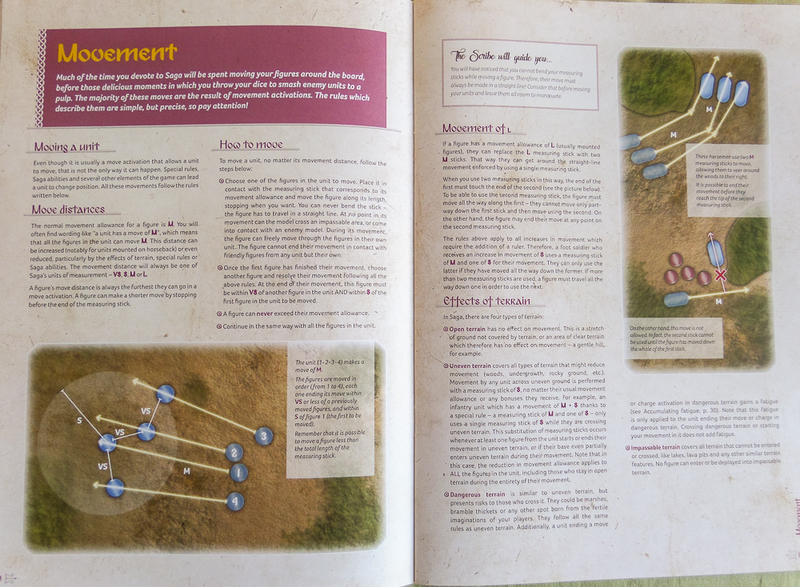 In the meantime, here's how a typical faction is covered in the book. 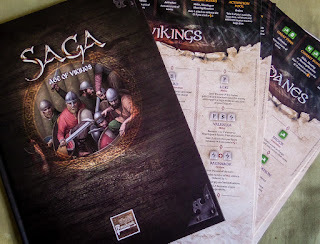 I managed to get my hands on an early release copy of the new Saga rulebook at the Vapnartak show in York at the weekend. I am a huge fanboy when it comes to Saga. It's the best skirmish game I have played - the rules are easy to pick up, but there are levels of complexity in how it can be played. If I could only ever play one game, it would be this one. Here's my first impressions on this update to my favourite game. 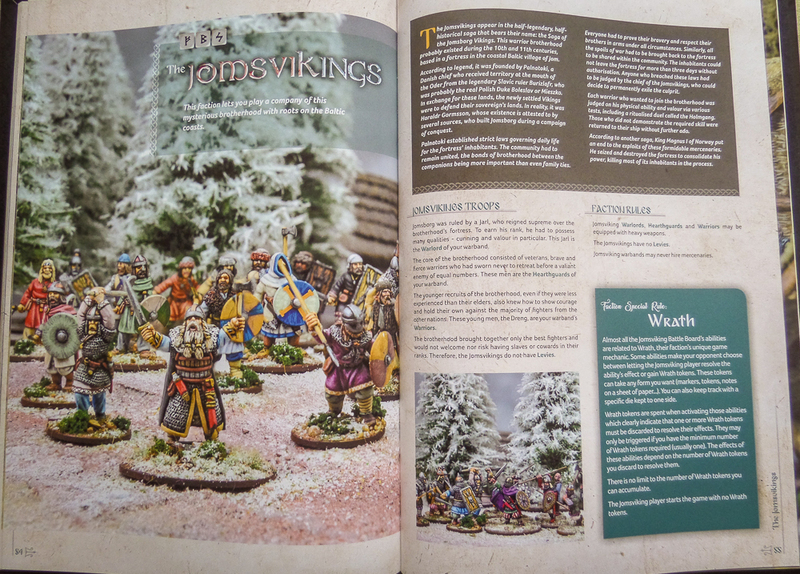 The rulebook is softback, 50 page A4 size, with good quality full colour pages. They get a bonus internet point from me for featuring Yggdrasil on the cover. It's certainly improved in layout since the first version. Everything is well laid out in a logical sequence. 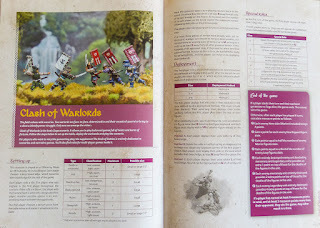 The contents progress from what you need to play, to the basic rules on orders and activations, more on activations, special rules and terrain rules, a scenario, a glossary and a reference section. Each section is well explained, it's mostly very precise and unambiguous, with little waffle or history or fluff interrupting the explanation of the rules. If you have played before you will breeze through this book, purely looking for changes from the previous version. If you are new to the game I suspect you may well have appreciated more examples of gameplay. 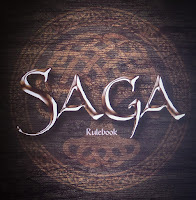 Like I said at the start, Saga is an easy game to learn, but explanations and walkthroughs for beginners are never a bad thing. Perhaps these will appear online at some stage. Veterans will still have to read the book completely, there are plenty of small but significant changes from the original version. There is no summary of these revisions, maybe this will be released online at some stage? Reading through the lovely book is certainly a pleasant way to spend an evening or two, but if you want to dive straight in with just a cursory glance you may come unstuck. There is one scenario to try out your newfound knowledge of the rules. It's a basic clash of arms - line up your troops, swing your axes and kill as many of the enemy as you can. I would have liked to have seen a little more than this. Three scenarios would have been nice, especially for completely new players. There is a Book of Battles mentioned, which will include more scenarios, so I understand the desire to hold back on this content. It keeps the rulebook clean and concise, but nevertheless one scenario seems a bit sparse. That minor quibble aside, I am really impressed by the new version of Saga. It's a nice looking book with great production values. From what I can gather on a first read through, the revisions make sense and will streamline an already good set of rules. An extra four pages containing two more scenarios would have made it an even better product, especially for newcomers. I am really looking forward to trying out the new rules. I did also pick up the new Viking Age book in Yorvik (sorry, in York) - my Danes and Vikings are eager to test out their new battle skills. More to come on the new Saga, when dice have been rolled in anger.